I have nice things to say about Glou, unlike seemingly every respectable food writer I can think of. (Am I respectable? I have no idea. Perhaps what I am about to write will disqualify me.) In its fundamentals, it's a completely fine bistrot à vin: simple, product-focused, and conveniently located in the heart of the Marais. The varied, well-priced list of natural wines alone makes it an appealing destination in that neighborhood, where a good glass of wine is astonishingly hard to find. If, until the other night, I had nevertheless declined to dine there throughout the three years since it opened, I think it's mostly due to the restaurant's polarizing marketing. 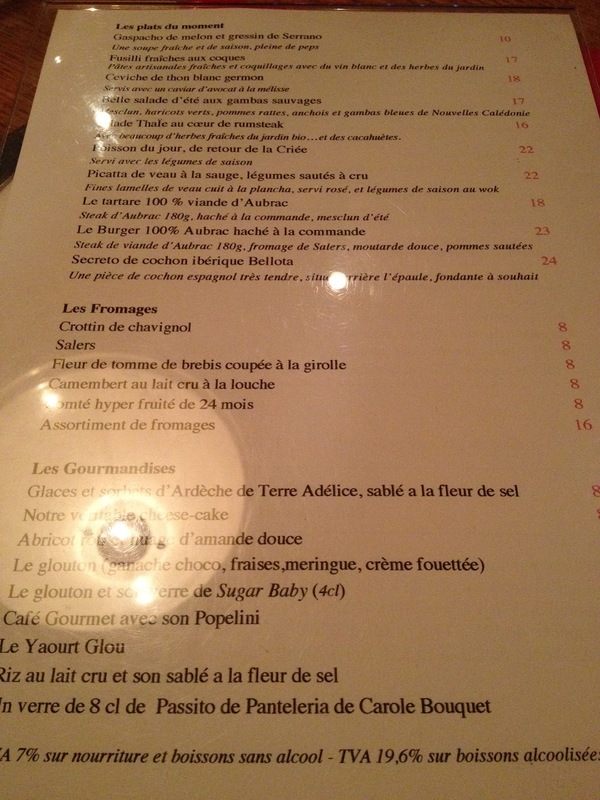 Glou, founded by food journalist Julien Fouin and film producer-turned-restaurateur Ludovic Dardenay, is sort of an object lesson in the hazards of letting food writers design menus. Reading Glou's, one feels as through one were reading the food section of a beauty mag. 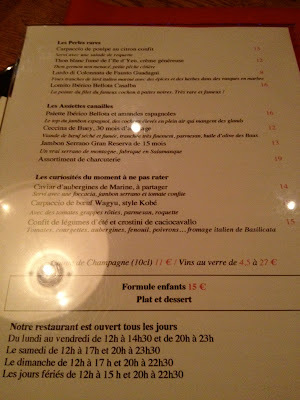 For example, a whole section of very slightly luxurious épicerie appetizers is called "Les Perles Rares." Another: "Les Curiosités du Moment à Ne Pas Rater." Wines are divided by theme, with some described as "des aventures, des surprises, loin des jajas standardisés, de vrais coups de coeur." This sort of precocious verbiage makes experienced diners gag. Even in food journalism, it's mostly confined to the hack subdivision that exists to conflate quality with luxury. 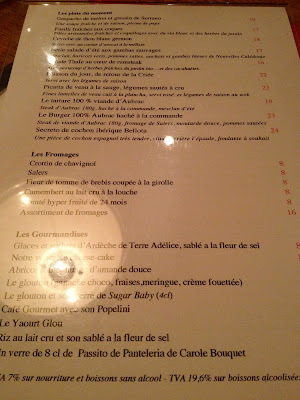 So seeing it on the menu, and seeing that Glou's loyal Marais audience overlaps quite a bit with that of the aforementioned beauty mags, I stayed away. The place seemed ditz-natural. So when I finally visited Glou the other night, at the urging of my friend A, a regular, I was surprised to find myself genuinely pleased by the experience, having possibly become a ditz myself. To be clear: my expectations were low. Unlike, again, many reviewers of this restaurant, I did not walk through the doors expecting any degree of gastronomic sophistication. But I don't know why anyone would, given the level at which the restaurant has pitched itself. Glou is open seven days a week and enthusiastically urges its clientele to sample such rare delicacies as Wagyu beef carpaccio and jamon Iberico, foods that are genuinely eye-opening, if one has been trapped under a rock since 1995. Glou is a pretty general-interest place. But who says meals need always be sophisticated? In addition to tickling our senses, broadening our understanding of culinary history, and challenging the norms of contemporary agricultural production, restaurant meals also possess the capacity to physically nourish us and provide relief from dish duty. I have a great fondness for meals that accomplish these last two things at a reasonable price, if only because my income and my sense of decency will always ensure that such meals outnumber, on a weekly basis, multi-course tasting menus with wine pairings. Simple meals comprise the enjoyable part of my life when I'm not thinking overmuch about food or wine. 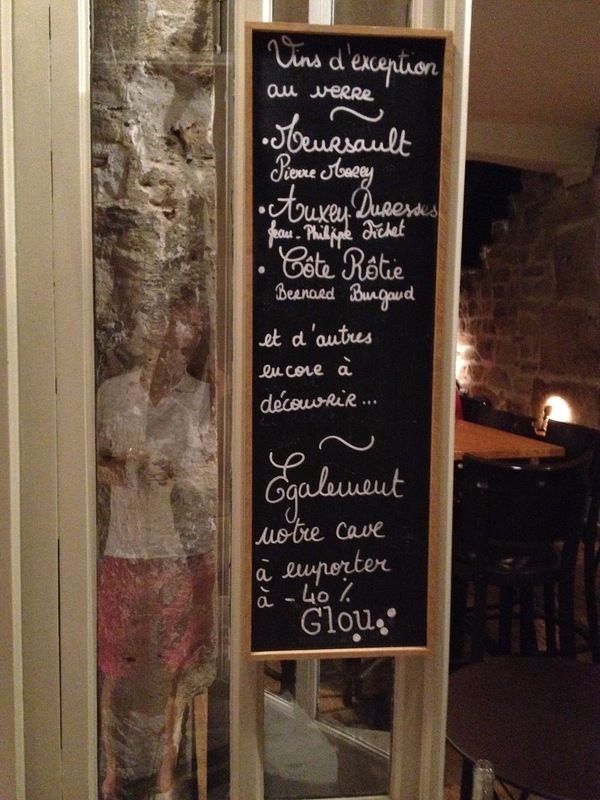 Almost despite itself, Glou proves to be a fine place for a simple meal. My friends and I repaired there for last service the other Sunday after a pétanque tournament, an event whose leisurely pace belies the great effort required to remain sober throughout its duration. Plates of lardo di Collonata and jamon Iberico both predictably delicious and, given the going rate for either product around Paris, not egregiously overpriced. My friend K's entrecôte was capably cooked, and the meat was of a succulent, silk-fatted quality that would have shined no matter who was cooking it. My own tartare was also totally acceptable, if slightly pastier than I prefer. 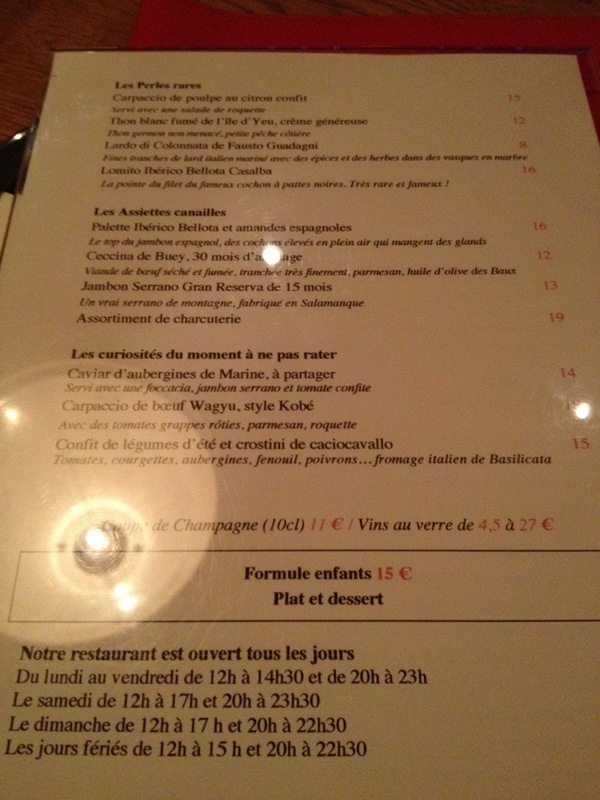 Pricing for plats is roughly in line with most quality-conscious paris bistros, i.e. late-teens to mid-twenties. Glou seems to have nonetheless acquired a reputation for being expensive, probably deriving from the fact that the all-day menu, while acceptably priced for dinner, is steep for lunch, and all entrées but one were over 10€. Most are charcuterie plates, designed to be shared, but the bad optics persist, and the restaurant would do well to add one or two 8-9€ solo apps. I have so far described a middling, well-intentioned restaurant, remarkable mostly for its opening hours. But Glou is distinguished by its wine list, which, while suffering from the same overwritten quality as the restaurant's menu, remains mostly natural, well-priced, and admirably broad in scope. 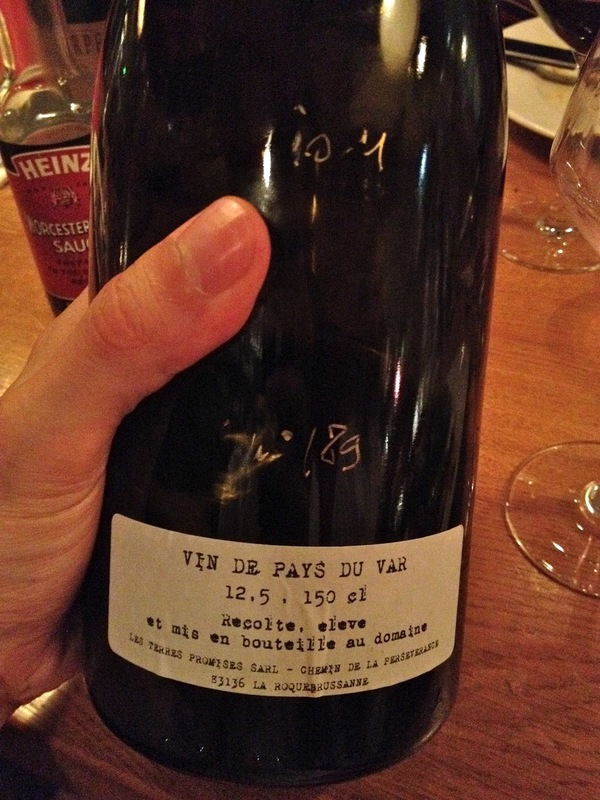 The restaurant employs one of those faddish overpriced enomatic monstrosities, with which it seeks to gain a bit of blustery wine cred by offering, among an otherwise admirably natural and modest wine list, the likes of Pommard, Meusault, and Condrieu by the glass. I am just the wrong audience for this - it's sort of thing I'll only ever appreciate if my health fails one day and I'm restricted to one glass per meal. In the meantime, the rest of Glou's list happily offers numerous emminantly potable selections at surprisingly decent prices. 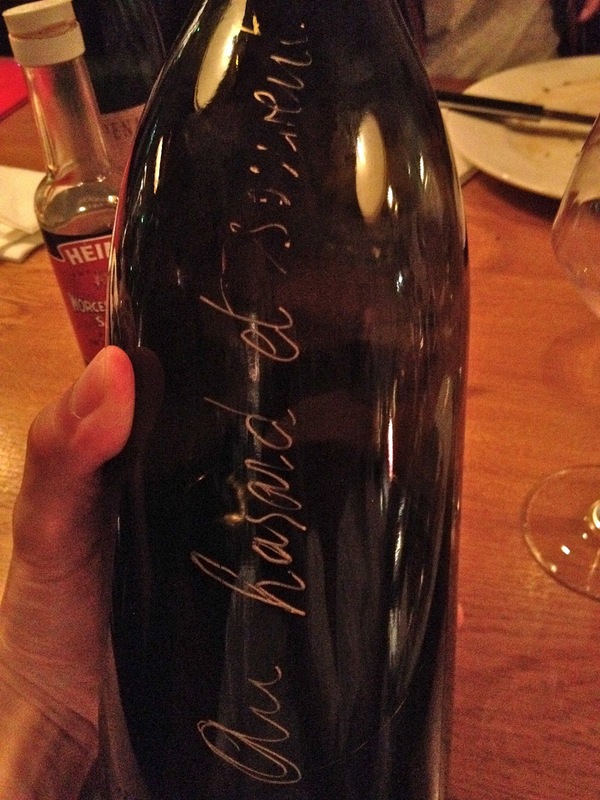 We began with a bottle of Guy Breton's 2011 Régnié, whose absurdly talented winemaker was, in this cuvée, almost able to overcome the Régnié cru's tendency towards stolidity and muteness. It might show better in a year but for now, like just about all Régnié I've ever tasted, it showed little of the aeriel spice I seek in good cru Beaujolais. 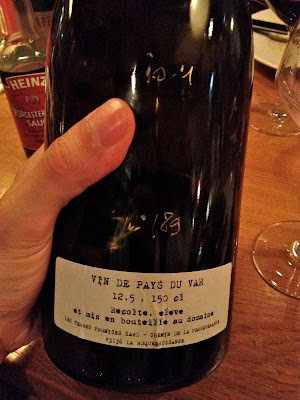 Later on the recommendation of co-owner Ludovic Dardenay we had glasses of something more memorable: Domaine Les Terres Promises' rare magnum-only 2011 Vin de Pays du Var cuvée "Au Hasard et Souvent." Domaine Les Terres Promises is a 12ha estate founded in 2003 by Jean-Christophe Comer, formerly a politics lecturer at the University of Aix. I have limited experience with the wines, but I read via the indispensable WineTerroirs that Comer cites Olivier Breton and Marcel Richaud as key influences on the style of non-interventionist wine he produces. At a place like Glou, where a reputation for simplistic cuisine and careless service is no deterrent to the clientele that fills it most nights, I can think of no reason to offer a wine as fascinating as "Au Hasard et Souvent." Unless one were to suppose that, beneath the pandering, the folks at Glou were actually sincere about what they seek to provide: real products and real wine in an accessible package. That this package is addressed squarely to the ditz demographic makes its contents no less satisfying for the rest of us, in a pinch.